iMedExchange Blog :: International Portfolio :: PRO IT Service S.R.L. - Choose a professional and accessible service for your online image! Tobin Arthur, from iMedExchange, wanted to engage me on improving his movable type blog. He established a couple of goals that he sent to me for revision and acceptance. Tobin Arthur, Founder and CEO at iMedExchange, asked me for some specific movable type consultancy work from his movable type v3.35 trougleshooting, to further developments and search engine marketing optimization. Around mid of June 2007, I had an email request coming from Tobin Arthur, which in summary was saying that his iMexExchange.com business has already a blog running on movable type v3.35, but he has some problems with it. He also mentioned what he would like to build up on his blog together, as well as the need for maximizing the search engine optimization (SEO). I've gladly replied to Tobin that I would be pleased to work on his project, but I also used that opportunity to propose him to perform together two surveys we are offering at PRO IT Service. One survey is called 'Blog Survey' and is basically a report we are making based on the customer blog performances. The goal of this blog survey is to in one hand to propose an eventual movable type templates optimization, and on the other to propose a set of most popular movable type additional facilities which help the blog owner improve the search engine optimization as well as a better user experience. The second survey is called 'Search Engine Optimization' and in essence is a report summarizing for you how optimized your Web site is for search engines. It starts from some specific technical aspects of your Web site and it continues with a set of movable type extra facilities that we recommend you to implement for assuring maximum search engine optimization. Tobin gladly accepted these two surveys. Apart his initial requests, once he seen the reports, Tobin decided to order a couple of movable type extra facilities from us, including social bookmarking services integration, pinging services, meta description and meta keywords, pagination, tags and tag cloud, rss subscription, a blogrolling facility, a much faster search engine, antispam protection, an AJAX rating facility and more. Since his hosting solution wasn't very well optimized for hosting movable type, I've proposed Tobin to keep hosting his general Web site where he was already hosted, but to have the movable type blog hosted together. As a matter of fact, we've create a sub-domain blog.imedexchange.com and we've set his domain registrar to point this sub-domain to one of our hosting servers, rented from Pair Networks, Inc. Since we are hosting blog.Imedexchange.com, as part of the advantages Tobin has hosting with us, his blog data is saved each and every Saturday. He is also getting an email notification every time a new movable type version is available. Occasionally, the upgrade is performed at no cost. Other times, the upgrade is more complex and Tobin is paying 50% of the upgrade fee we are charging. 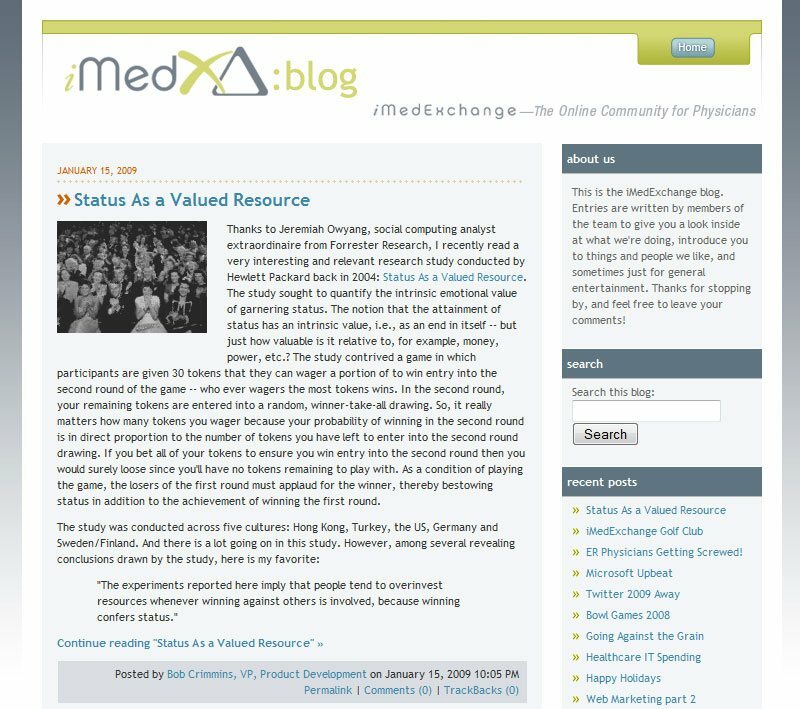 Worth mentioning is that during 2008, I've worked on restyling the iMedExchange.com blog to match the new general Web site look and feel. Let me display two screen captures for you, one took of the blog main page, the other of the weblog individual article page. 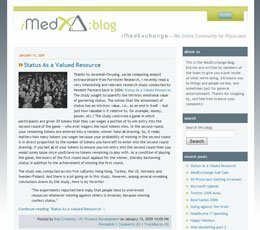 The weblog is publicly available at blog.imedexchange.com. Contracting from iMedExchange Inc., Seattle, Washington, U.S.A.